I passed my general exam yesterday, in no small part due to the all natural gift basket that Danny sent. It was full of delicious goodies like potato sticks and whole grain chips and pistachios and fancy mustard and salsa. 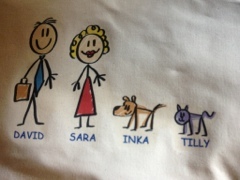 It all came in a customized tote bag, pictured below, with all of our pictures on it. I don’t know what I like more- that I’m wearing a blonde wig and lipstick, that David is wearing only a tie, or that Tilly is purple. Inks looks pretty normal. 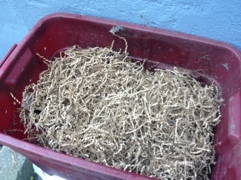 Also, the all natural packaging is perfect bedding for the worm bin!